The Scottsman David Roberts’ (1796-1864) was an excellent artist and draftsman who traveled extensively sketching local scenery and costumes. 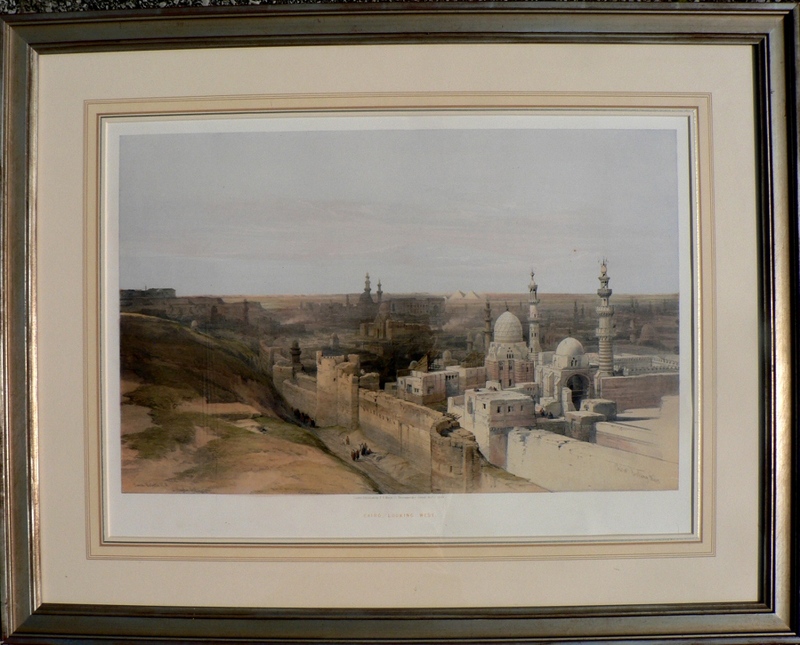 His greatest achievements were his works on the Middle East, Views in the Holy Land, Syria, Idumea, Arabia, Egypt and Nubia and the work in which this colored lithograph appeared, Egypt and Nubia. Roberts was captivated by the Egyptian ruins. In the autumn of 1838 he hired a boat to take him down the Nile and made detailed drawings of the landscapes he viewed into lands were wild and often inhospitable. This view of Cairo includes the Mosque of the Amir Aqsunqur (also called the Blue Mosque or the Mosque of Ibrahim Agha)on the right, its minaret displaced by Roberts in order to include it within his composition, next to it is the Mosque complex of Amir Khayrbak, the Citadel is in the left distance and the pyramids are shown in the distance on the right. Roberts&apos; work introduced western society to the wonders of the Middle East with accuracy, sensitivity and beauty. 16 x 23 ¼ inches sheet size. Framed to 24 x 30 inches.